Easter Sunday is the perfect time to gather everyone together to enjoy a delicious family meal and for that it’s got to be a roast. If you’ve just wondering what to cook then let me help. I’ve put together a deliciously seasonal and very traditionally British menu that requires very little last minute prep. So you can spend the time hunting for that last egg hidden in the garden instead. I love the easter holidays. It’s so much more relaxing than Christmas with a lot less pressure for everything to be perfect. Plus easter Sunday is the one day of the year where eating chocolate for breakfast is more or less compulsory. There are not many days of the year we can get away with that. Nothing like starting dinner with a glass of pink fizz. 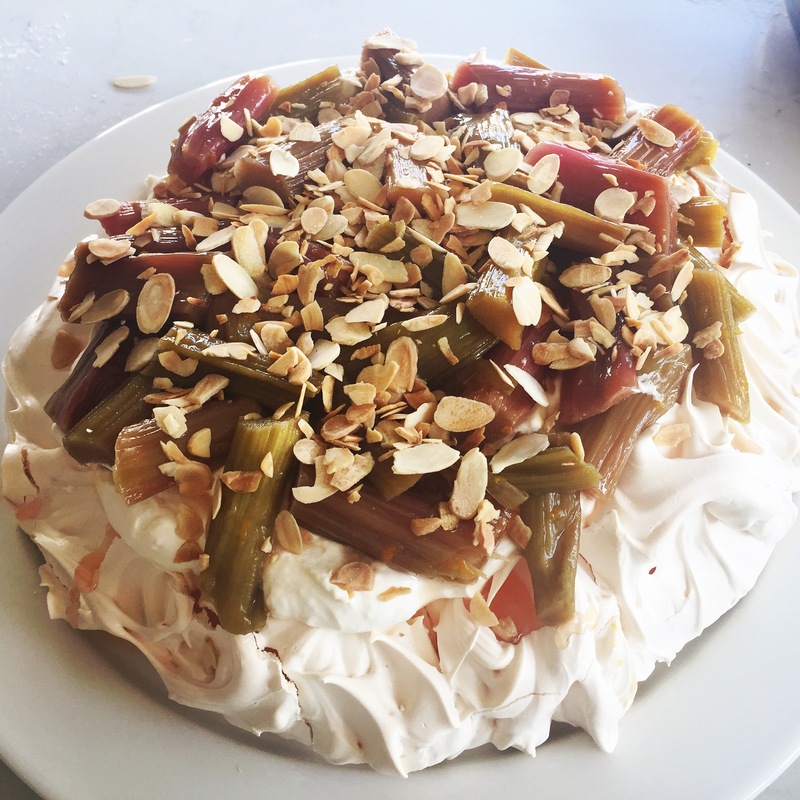 If you are serving the rhubarb pavlova for dessert place 1 tablespoon of the sauce in the bottom of a champagne flute. Top up with the fizz of your choice. Asparagus season has started early in the UK this year and according to Brian, my brilliant greengrocer, its really good too. English asparagus isn’t normally available until the end of April so being able to eat it for Easter is a rare treat. 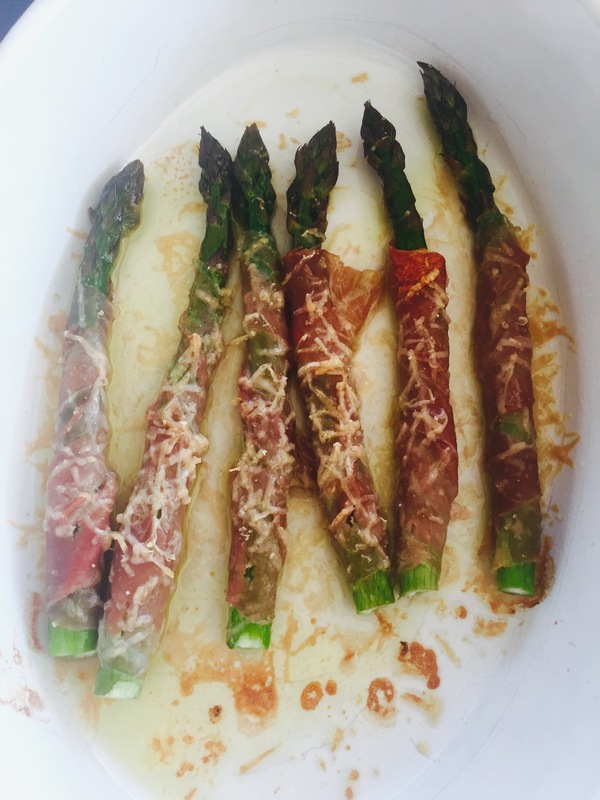 For the first of the English asparagus I find it needs little else doing to it than steaming and tossing with butter but if you fancy doing something a little different that you can pass around before your Sunday lunch then try this recipe. Hold each spear of asparagus between both hands with one hand towards the bottom on the steam. Bend until the woody end snaps off. Tidy up the end and run a knife along all sides to remove the tough spurs. Wrap half a slice of prosciutto around each spear and place in an ovenproof dish. Drizzle over the olive oil and then grate over some fresh parmesan. You can do this ahead of time and just keep in the fridge until you are serve. Cook in a moderate oven – GM6/ 200° C (180° C fan) for 12 – 15 minutes (depends on the thickness of the spears). Test the asparagus is done by piercing with a knife – there should be no resistance. I love a watercress soup. It looks so gorgeously green while tasting really refined and at the same time ridiculously healthy. 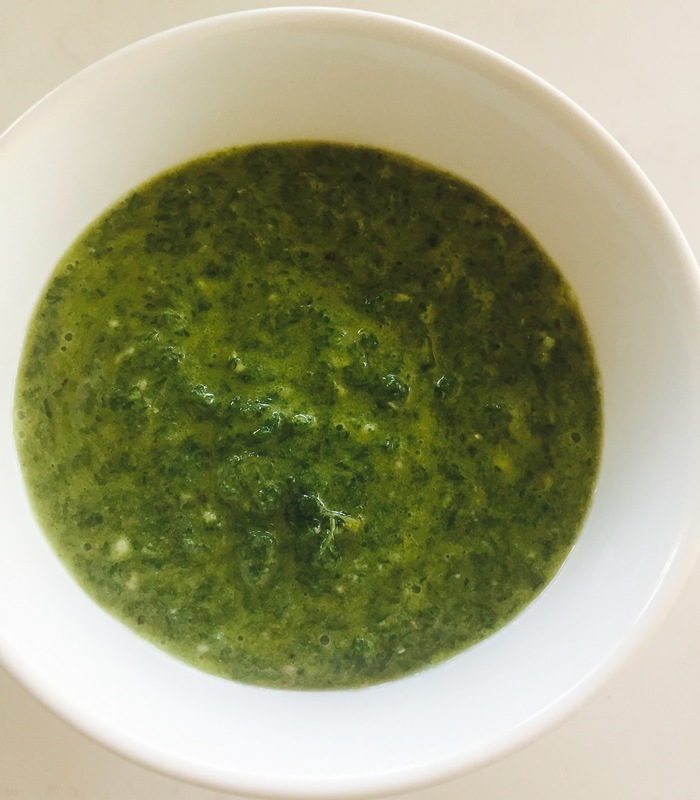 Watercress soup is traditionally made with potatoes to thicken it and onions but I like to use a base of leeks to enhance the freshness and I’m never one to shy away from packing more veg into a traditional dish in anyway I can sneak it in. The blue cheese toasts give it a rich salty bite which finishes it off perfectly. Blend until smooth. Take off the heat if you’re not serving straight away to maintain the bright green colour. Reheat gently to serve. Crumble over the stilton and place under the grill for 30 seconds or so. 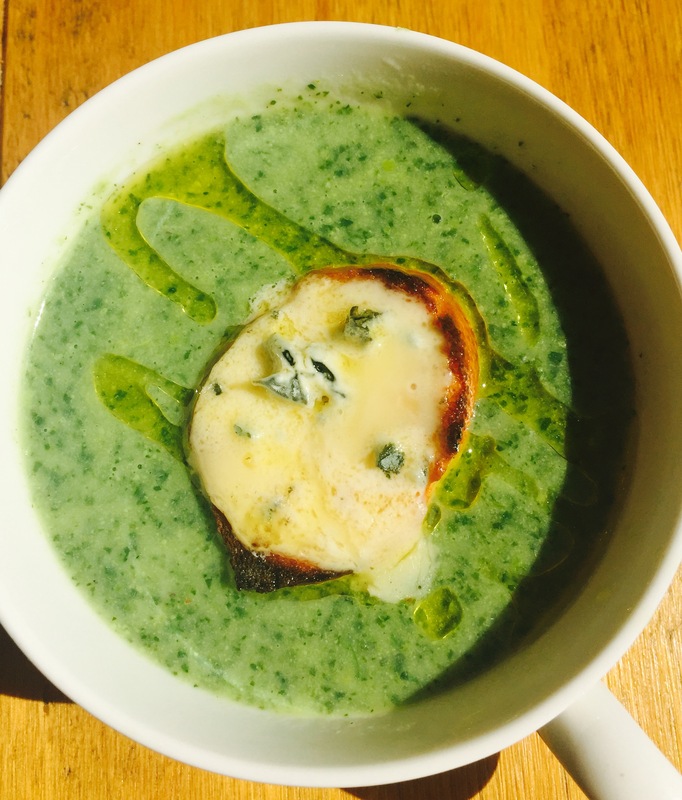 Serve the soup with the stilton floating on the middle and some chives for decoration if desired. 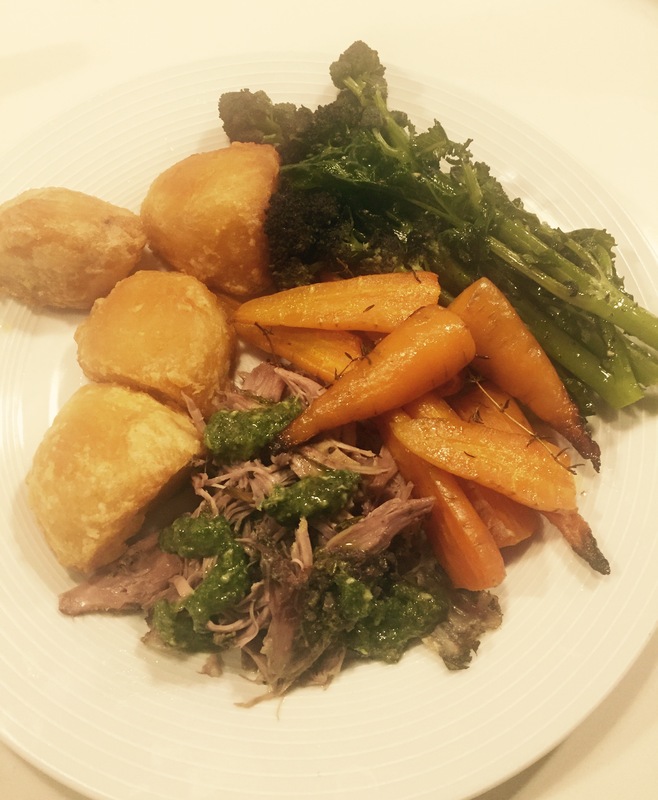 A shoulder of lamb is perfect for when you don’t want any last minute hassle. It will sit quite happily in the oven until you are ready to serve it. You can get all the prep done and the lamb in the oven early on in the day so that is one job out of the way. If you need to get the lamb out the oven so you can turn up the heat to cook your roast potatoes I like to just pop it into my top / oven grill that I have pre heated and then turned off. That will keep it warm for a good hour while you cook your roast potatoes. 300ml lamb of chicken stock. Pre-heat the oven to 170° C (150° C fan) / GM3. Strip the leaves off the rosemary stalks and finely chop, roughly chop the cloves of garlic and the anchovy fillets – add to a pestle and mortar and bash together to make a paste. If you don’t have a pestle and mortar just finely chop all 3 ingredients together. Mix in the mustard and olive oil to make a paste. Season with pepper. You shouldn’t need salt as the anchovies are quite salt. Place the shoulder of lamb in a roasting tin that just fits the lamb snuggly and pierce all over with the tip of a small knife or a skewer. Rub the paste all over the lamb. Pour one of the glasses of wine and the same quantity of water in the bottom of the tin and cover with foil. Place in the oven for 4 to 5 hours checking that all the water hasn’t evaporated away after 2 hours. 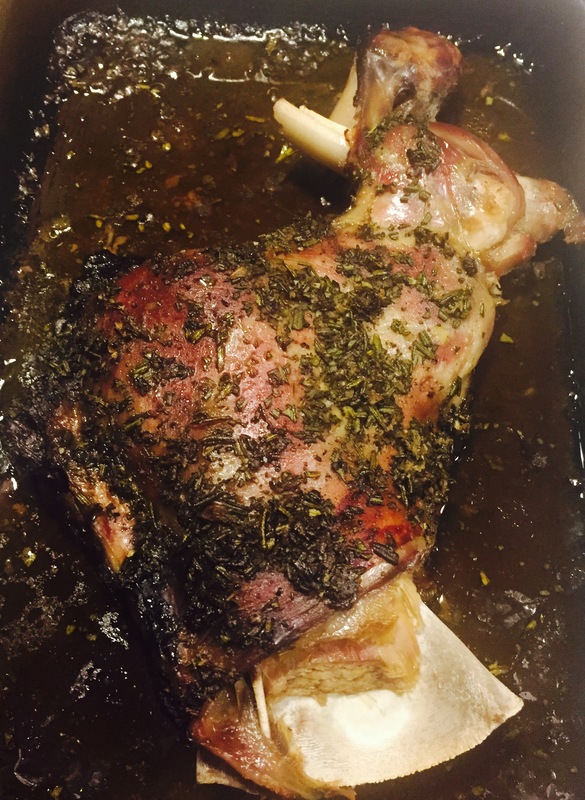 The shoulder of lamb is cooked when the meat is soft enough to shed with a fork. Place the meat on a carving plate and cover with foil to keep warm. Tilt the tin gently onto one corner and spoon off the oil on top the meat juices. Heat the meat juices over a gently heat and add the second glass of wine. Bubble until the steam no longer smells of alcohol. Add the red currant jelly and stock and bring to a simmer. If you prefer a thicker gravy mix 2 teaspoons of cornflour with a little water until you have a smooth paste and add to the boiling gravy and stir. I know mint sauce is traditional with lamb but it’s never really been my favourite. It’s a bit too vinegar-ey for my taste. I prefer a salsa verde. However that is not very British so a mint sauce it will need to be. I’m just going to give mine a bit of a salsa verde twist by significantly reducing the vinegar content. Is that cheating? Chop everything except the oil and vinegar together by hand or in a mini chopper. Add the oil and vinegar to taste. This will keep in the fridge for a few days so no need to just use with the lamb. Its lovely drizzled over all sorts of meat and veg. Now I know a roast potato can be a controversial topic and to say I make perfect ones is a big claim no doubt. Nothing ruins a roast dinner than disappointing roast potatoes but this method works for me every time. It also means there is no last minute peeling or fuss. 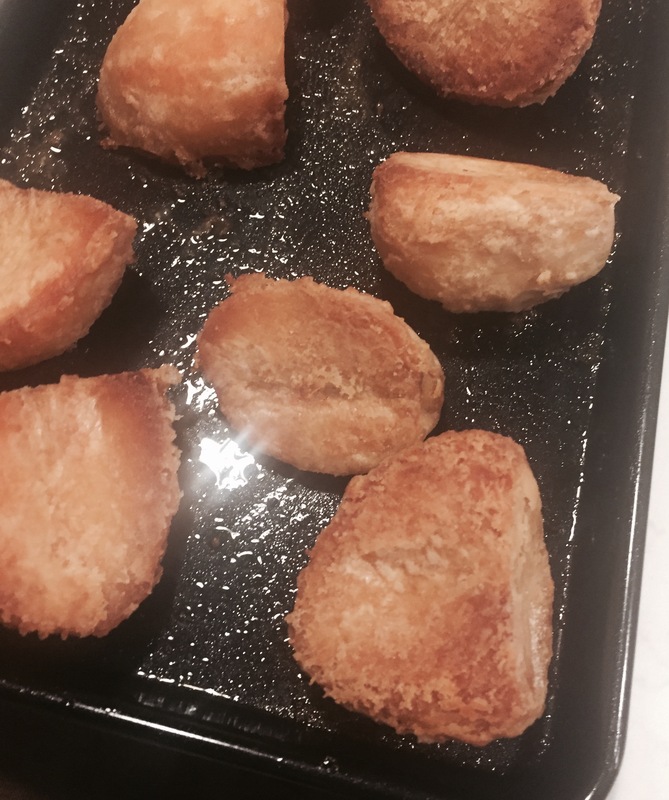 All the work for these roast potatoes can be done as far in advance as you like. I typically have my roasties for Christmas done by mid December at the latest. Firstly you need Maris Piper potatoes. Now don’t argue with me I am definitely right here. I have put in extensive research. I reckon for 6 people you need about 1.5kg of potatoes. Place your cut up potatoes into a cold pan of water, bring to the boil and gently simmer for 6 minutes. When you are ready to cook your potatoes pre heat the oven to 200° C (180° C fan) / GM6 with a roasting tin with generous coating of rapeseed oil. I think rapeseed oil gives the best crunch but you can use goose fat or duck fat if you prefer. Once the roasting tin and oil are really hot add the cold roast potatoes and cook for 20 mins (25 if cooking from frozen). Then turn the oven up to 220° C (200° C fan) / GM7 and cook for a further 40 mins. Perfect roasties every time. This recipe is more traditionally referred to by my group of my friends as “Kates mums carrots”. My friend Kate mum is an amazing cook. Kate is really good herself and has taught me lots of lovely tips and recipes. She now lives in the US so we don’t get to spend nearly enough time sat around drinking tea and talking recipes any more. I do however always think of her (and her mum) when I cook my carrots this way. I often do my carrots this way when I am doing a roast. Its lovely to know you can get one beg fully prepared in advance and just pop it into the oven with no last minute hovering over boiling pans of water. 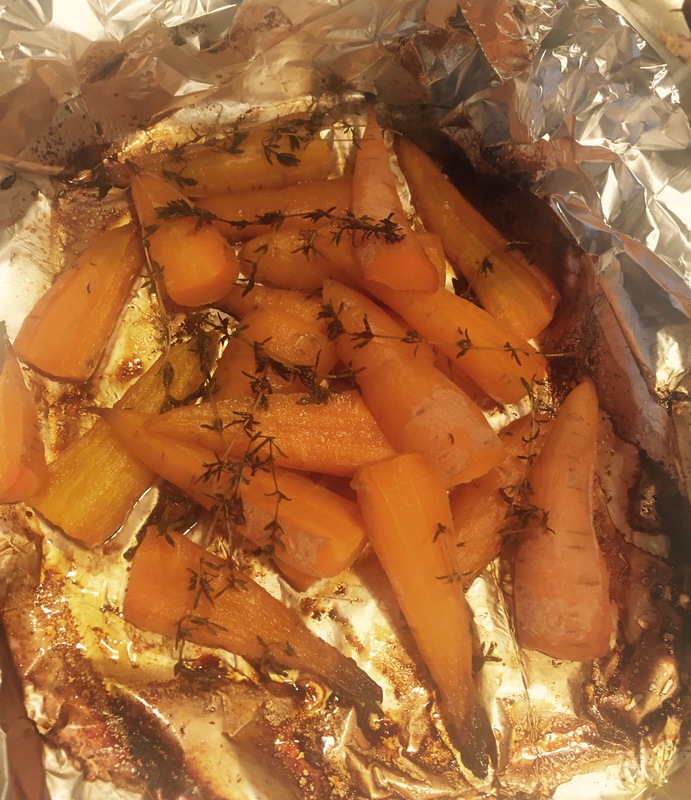 In a baking tray lay a large sheet of foil, double the size of the baking tin and large enough to encase all the carrots, fold the foil in half an open up again. Place all the carrots on the bottom half of the foil. Dot over the butter and then scatter over the sugar and thyme. Season and then add the wine or water. Fold the foil back over and crimp the edges to make a parcel. Place the parcel in the bottom of the oven (first under the lamb and then under the potatoes) 1.5 hours before you want to serve. Check the carrots after 1 hour just to make sure all the liquid hasn’t evaporated and the carrots are starting to caramalise. At this time of year it’s too good to mess about with much. Just steam and drizzle with extra virgin olive oil before serving. Everyone loves a pavlova and no matter how stuffed you are after a large meal you can always squeeze in a small slice. I love a dessert that can be made in advance as the last thing I want to do after a large meal (with a glass or two of wine) is get up and start fussing over dessert. I can just about manage some whipping of cream and artistically placing some rhubarb which is all that is really required. I’d make the meringue and cook the rhubarb the day before. I made this with rhubarb from my garden. Place the sugar into a large ovenproof dish big enough to fit all the rhubarb. Grate on the zest of the orange and then squeeze in the juice. Mix together to make a paste. Cut the rhubarb into 5cm / 2 inch pieces and add to the dish. Mix into the paste so it coats the rhubarb. Cover the dish with foil and place in the oven. Cook for 15 minutes and then stir. Recover and place back into the oven for a further 15 minutes. Check to see if the rhubarb is cooked by piercing with a skewer or small knife. Allow the rhubarb to cool and then drain the syrup into a small saucepan. Boil the mixture until reduced down by about half. Place a piece of baking paper on a baking tray. Place a plate or cake tin approx. 20cm wide on the paper and draw a circle around it with a pencil. Flip the paper over so you can still see the circle through the paper. Place the eggs white in a clean bowl and using and whisk until they form stiff peaks (ie when you stop whisking and lift the whisks the mixture forms stiff peaks that don’t flop over at the top). Add the sugar one tablespoon at a time whisking back to stiff peaks between each addition. Once all the sugar is in continue to whisk at a high speed for another 5 minutes or so. Spoon the meringue mixture onto the baking paper using the circle as a guide. If the paper is slipping about, place a few blobs of the mixture under the paper to hold it in place. I find it easiest to pile the mixture up in the middle and then edge it outwards slowly with a large spoon. Try and make a dent in the middle so the edges are higher. Swirl the edges with a skewer. Place the meringue in the oven and cook for 1 hour. Then turn off the oven and leave the meringue in there until cold. If you don’t have enough time for this then just propr the oven door open with the handle of wooden spoon to cool more quickly. This helps prevent the meringue from cracking. Peel off the paper and place on a serving place. Cover with foil and keep somewhere cool (not the fridge) out of the way until you are ready to serve. Toast the almond flakes in a dry frying pan for approximately 5 minutes until they turn golden brown. To serve whisk the double cream until stiff and fold in 3 tablespoons of the rhubarb sauce. If any of the rhubarb has collapsed and lost it shape fold that through the cream too. Pile the cream into the middle of your pavlova. Place the cooked rhubarb over the cream and drizzle over 1-2 tablespoons of the sauce. Scatter of the toasted almond and serve immediately. Serve the remaining sauce alongside.